Can’t seem to keep the speed demons from barreling down your neighborhood streets? Here is one clever design by Christophe Machet sure to get them to take their foot of the accelerator. Comissioned by the Municipality Of Gland, Switzerland, each sheep is bathed in a bright and reflective color, forming a flock that calls for greater driver attention and the much appropriate stop. The sheep are also multifunctional pieces that can be used as a benches, interior decor, sign holders, flowerpots and more! Can't seem to keep the speed demons from barreling down your neighborhood streets? Here is one clever design by Christophe Machet sure to get them to take their foot of the accelerator. Comissioned by the Municipality Of Gland, Switzerland, each sheep is bathed in a bright and reflective color, forming a flock that calls for greater driver attention and the much appropriate stop. 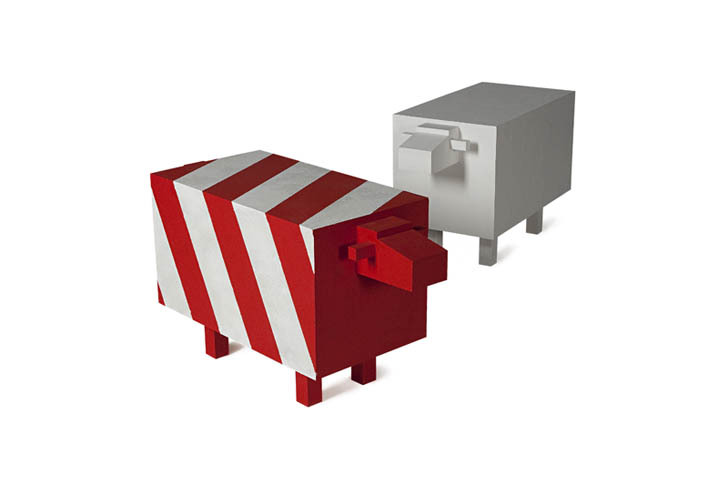 The sheep are also multifunctional pieces that can be used as a benches, interior decor, sign holders, flowerpots and more!